A good friend of mine who lives in Paris recently sent me the French edition of the New York Times Bestsellers "Deluxe: Luxury Losts Its Luster". It had just been released in France and since she shares my passion for fashion, she thought I would find this book fascinating. She was right. This is an absolute page-turner. 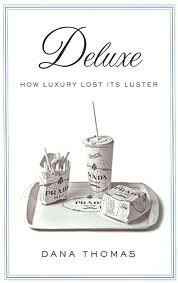 "Deluxe: How Luxury Losts Its Luster" is written by Newsweek reporter Dana Thompson. It is a well-researched behind-the-scene tale about the luxury fashion industry today. Thomson outlines how, not too long ago, luxury fashion was a symbol of the lifestyle only available to a small elite of aristocrats. At that time, the couture fashion houses were known for their craftsmanship and their attention to details. Quality was then considered the hallmark of couture. But since 1950, the luxury industry went from family-owned businesses to global conglomerates that now operate with a different set of values: leveraging their brands through mass-marketing and maximizing profitability for their shareholders. Deluxe documents this shift through countless encounters with key industry players such as Marc Jacobs, Karl Lagerfeld and Miuccia Prada. Thomson also reveals surprising anecdotes from how the Birkin bag got its name to the Japanese overwhelming enthusiasm for designer labels. The book is a real eye-opener about the "Deluxe" world, from how it was created to where it has evolved until today. A great read!